A concrete driveway represents an investment that is designed to last a lifetime, provided proper procedures are followed. The average home-owner will IlQ1 normally be able to install a concrete driveway without expert assistance. It is strongly recommended that a qualified contractor be engaged to ensure a satisfactory job. To provide a quality driveway, the following guidelines must be carefully observed. Concrete can be placed directly on uniform subgrade after removing the topsoil, or on deteriorated asphalt pavement. Excavate or bring to grade as necessary using granular ‘A’ as levelling course (typically 100mm). Make sure sub-grade is uniform, well compacted and contains no frozen material. Slope away from buildings at 2%. To form driveway, use stiff wood forms kept in position with stakes not more than 1 metre apart. Top of stakes should be flush with, orslightly below, top of form at finished grade [see screeding – section 4 (e)). Plan exact position of concrete joints (see part 6). DO NOT ALLOW power floats or trowels to be used. Overworking the fresh concrete causes scaling. This extra finishing is not required and will reduce the durability of the slab. using quality proven aggregate. 48 hours advance notice of delivery should be provided. 8%) must be measured after the colour has been mixed in. placing on hot, dry days. curing materials (burlap and water or curing compounds). A .1QQmm slump is adequate for placement. Adding water to increase the slump or workability has a very detrimental effect on both strength and durability of the concrete. Distribute concrete using wheelbarrows (or directly from concrete mixer truck if possible); use shovels and rakes to bring to rough grade avoiding segregation. Screeding: Smooth the surface using the long handled bull-float (use edging tool to finish edges) – DO NOT USE STEEL TROWELS AT ANY TIME. For final non-slip finish use a concrete broom, burlap drag, float or Impressed mat finish. be prepared for fast setting during warm weather. protect hardening concrete by curing concrete immediately after final finish. During cold weather, longer time is required before performing final finish. Do not perform final finish while concrete is still bleeding. NOTE: Improper procedures can result in a poor quality job. Colour can be added to the Mix! Wet burlap, soaking hoses, waterproof paper or polyethylene film to keep the surface CONSTANTLY wet for 7 days. Do not place hoses on surface. DO NOT APPLY DE-ICERS (eg. SALT) UNTIL THE CONCRETE HAS CURED FOR 30 DAYS. DO NOT USE AMMONIUM BASED DE-ICERS AT ANY TIME. If the concrete is placed in the late part of the year below 5’C, use polyethylene film or other cold weather curing methods. 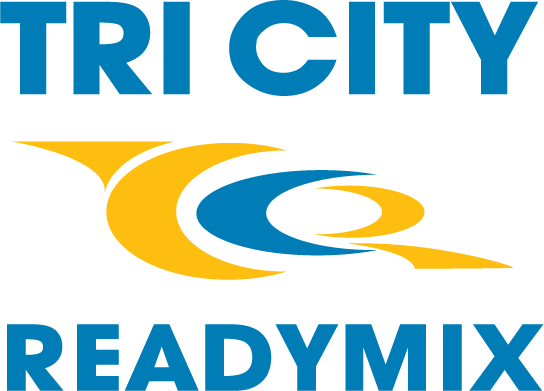 An air drying period of one month after the curing period is required before de-icing salts can be applied. A PENETRATING SEALER can be applied as caution against chloride penetration. after a period of air drying if water-cured. cut as soon as possible without pulling the aggregate out, usually within 4 to 12 hours after concrete has been placed (can be much longer in cold weather). cut 1/4 the thickness of the slab – minimum depth. not more than 3m apart for 1 OOmm thick slab, 4m apart for 125mm slabs, and 4.5m apart for 150mm or thicker slabs. SUBGRADE MUST BE UNIFORM AND COMPACT. 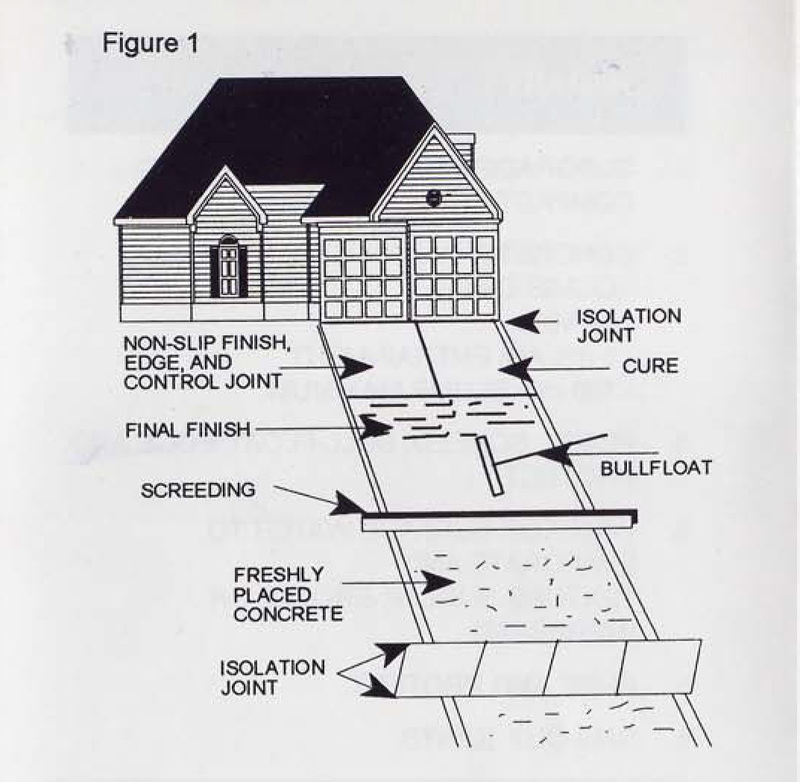 PLACE, SCREED, BULL-FLOAT, EDGE AND PROTECT. WAIT FOR SURFACE WATER TO EVAPORATE AND TEXTURE-BURLAP, BROOM, OR IMPRESSED. It is common for all concrete to go through a slight shrinking process as the plastic or wet concrete hardens (dries) and loses water. 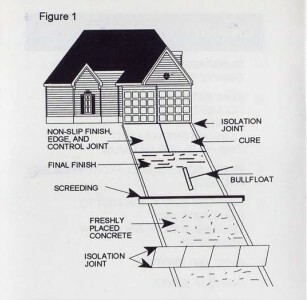 Too often contractors demand excessive amounts of water to be added to the concrete prior to placement in the forms, to make concrete more flowable. This excessive water is very harmful to the overall performance and quality of your concrete. This practice does not conform to Ontario Building Code minimums. Home Builders and Forming Contractors should be following the minimum standards as set out in the Ontario Building Code and many do. 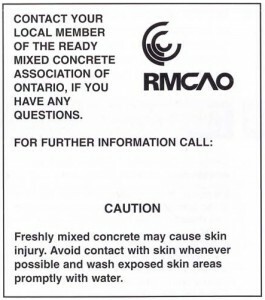 Ready Mixed Concrete Association Members offer Performance Rated Concrete to the marketplace across the province. PRC is designed to offer the builder and/or contractor concrete with improved performance with the placing characteristics he/she is used to, and still meet OBC minimums. 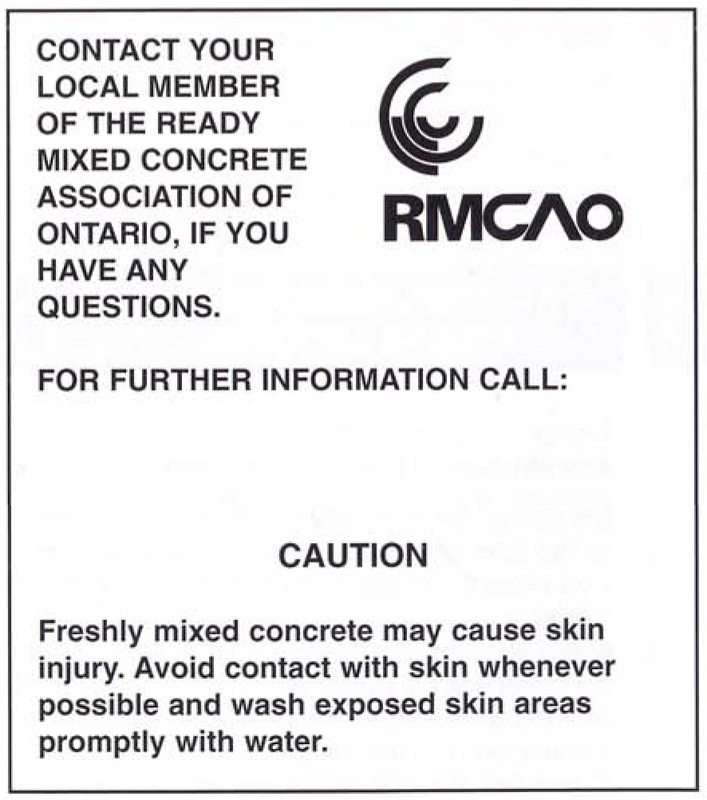 Ask your Builder if your concrete is PRC. Structural Cracking can be seen in two basic forms, each with its own cause and affect. Backfilling – if basement walls are backfilled too early and/or with improper procedures followed, the result can be a crack. It can be caused from too much lateral pressure exerted on one side of the wall, with no lateral support or sufficient bracing on the inside of the wall during the procedure.